Generally speaking, a linter is a tool that examines your source code, looks for any potential problems, and makes recommendations for things that could ultimately lead to bugs, and/or that can improve the readability of the code. JSHint is a community-driven tool that started as a fork of JSLint. It’s a bit more relaxed than JSLint and doesn’t enforce a specific coding style on to its users. At any rate, running your code through a linter is one of the easiest things that you can do to help begin formatting your code in a standard way. This may not actually contribute to the bottom line of writing better code, but I think it contributes directly to the performance of your theme, plugin, or application. When discussing WordPress Assets, it really boils down to the number of HTTP requests being made and the size of the files being downloaded. Whichever you choose, I recommend that you and your team use the same one so that minification is also standardized. When working with the public view, we don’t have access to the get_current_screen function, so we end up having to come up with alternative ways of registering and enqueing scripts. Depending on the nature of your project, you may be able to get away with looking at the page ID, looking at the page slug, looking at the page title, the current user ID, the current user role, whether or not the user is logged in, etc. Whatever method you choose, it’s more important that it’s portable among installations (for example, will all users be using the same permalink structure that you’re expecting?). I used to think that the code could be its own documentation, but the more code I write and the more projects that I work on, the less and less I believe that. In fact, one of the things that I tell others during code reviews is that they should be commenting their functions, potentially confusing lines, and every single block of code. Regardless of how verbose your code is, it’s still code and it’s unlikely that you’re going to be able to decipher your work in a few months, let alone someone else’s in future months. * The callback for when the follow/unfollow request is sent to the server. Speaking from experience, I know that in the next few months this will be easier to follow than without the comments. Yoda Conditions are one of my favorite part of the WordPress Coding Standards. I use them all in the time when writing jQuery in WordPress and linters don’t care about them at all. Brace Style. I’m a fan of using braces 100% of the time even if the evaluation of the condition is a single line. It’s verbose and shows exactly what I’m trying to wrap in conditionals. Clever Code. Sure, as programmers, we love trying to wrap as much stuff into as few lines as possible, but, again, in a few months, do we really want others to have to map out what we’re doing to try to make sense of it? Hopefully no – I wouldn’t want them doing that to me. The bottom line is that if a lint utility doesn’t catch a problem and you’re wondering how best to proceed with writing a certain bit of code, try defaulting to the WordPress Coding Standards. As I’ve said throughout these two posts, I’m not looking to define the coding standards for WordPress – I’m simply trying to offer suggestions for a significant problem that’s so pervasive across the development. Surely I’m not the only one with an opinion on this, so feel free to share your thoughts, too. Is register script just used for DRYing out the code? Can’t you register and enqueue in the same wp_enque function? I assume you would register it if you enqueueing on a conditional basis? For example, you would register all your styles and scripts in the top of your plugin, then conditional enqueue them for different situations? Also a good guide to performance tuning JS selectors. All while it’s totally acceptable to just use wp_enqueue_scripts (and I know plenty of developers who do! ), I’ve always been on the aggressive side so I tend to play it safe. I like to always register first for sanity sake. That way I can just enqueue w/ the handle. It’s not really necessary, but if all scripts are registered in a central location, they can then be enqueued conditionally in the same place (on the wp_enqueue_scripts hook) or in template files or whatever in a theme (since WP 3.3ish?). Anyway, just makes life easier for me when I work on a lot of sites. Great post Tom! I hadn’t come across those linters before – do you know if they look for bugs that would appear in IE7,8? (This would save me a lot of trouble!). I agree with Brian here – I register the scripts in one location and then I can just call wp_enqueue_script() whenever I need it (e.g. 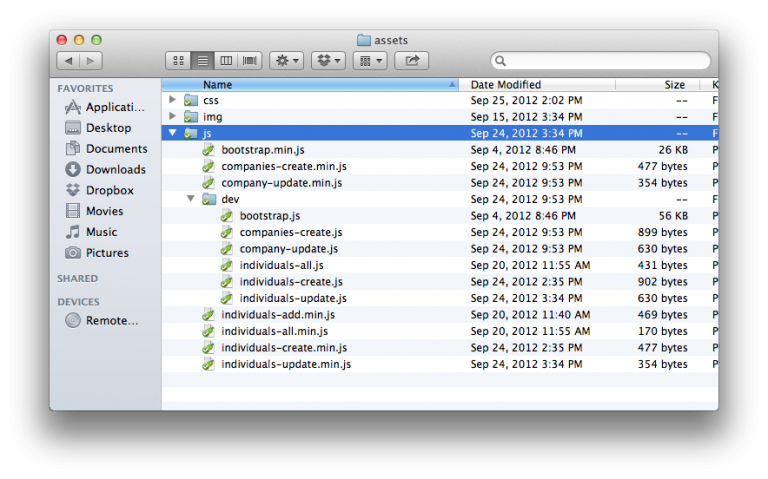 template files, widgets, shortcodes). @Brian – yes its 3.3. For admin pages I tend to use the load-* hook – it’s not fool proof, as sometimes you still need to check the screen ID, but works well for custom admin pages. Keeping ‘dev’ versions of the script is a good idea. For core scripts WordPress checks the constant SCRIPT_DEBUG and conditionally loads the dev versions – I like to do the same for my plug-in scripts. Also, I’ve recently begun using SCRIPT_DEBUG myself. I started when I was working on a couple of patches to core and have since kept doing so (especially since I’ve begun linting and minifying my script files during development). I have not heard of Yoda Conditions until this post. I haven’t always written my conditionals that way, but now I do it in every language. I think it pays dividends and I wish this was the way it was taught on the web, in books, and/or in school. Next PostNext Version Numbers: What’s The Point?